Grand Champion MayFest 2011-hoping for a repeat! Last year at this time, I watched Lauren and Mickey at the “AA” rated MayFest show in Katy,TX. We had been doing alright with the move from hunters (slow, steady and pretty) to jumpers (fast is as fast does). But the best the Lauren and Mick combo had ever come up with was a second place ribbon and only at a lower rated “B” show. It was with delight and astonishment that Lauren and Mick won their first jumper class last May. I remember being so excited that I texted my friends. I actually was beside myself with joy. I could not believe they had done so well. 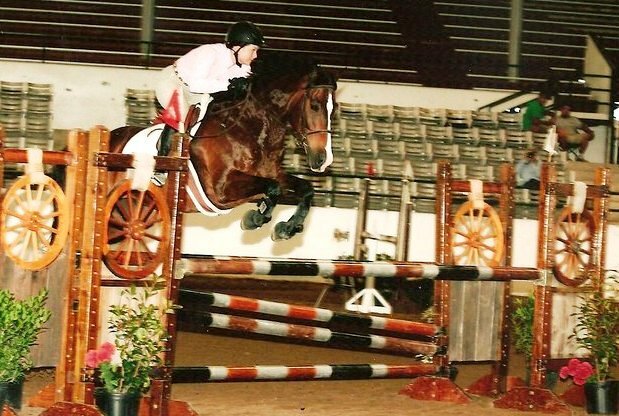 They were riding against adults (Lauren was still rated as a junior rider then) and against professional riders. It was like the switch had come on and they just got it. The Davangs were our mutual friends from our old Sugar Land barn and it meant the world to me that Gaylyn was so impressed with Mickey and that she thought our other friends would be as well. It was one of the better days of my life. Today, the MayFest started again. It will be the first show for Mickey and Lauren since Lauren’s bad fall in February. Lauren had her last finals at school today so trainer Dev Branham took Mickey through the paces. I learned that they came out of the first class blazing fast. And no one could catch their time. Dev said he was a little surprised and quite delighted with the little brown gelding he rode. First place was Mickey’s to start off the MayFest. They returned for the .90 meter class. Dev had tuned up his attack plan and even though the fences were higher, their time was faster still. No one caught them. They won this year by four seconds. It was still a big margin of victory. Dev said Mickey was a blast. He really had a different sense of him, riding him rather than watching Lauren on him. He called him handy and quick. He walked away with two blue ribbons for the day. Tomorrow, Lauren will be back in the saddle herself with Mickey. They will be riding again for the fastest time. I hope history repeats itself and MayFest is our fest again. This entry was posted in Horses by Exechorseluver. Bookmark the permalink.